Felix Gillette at Bloomberg Businessweek has come up with a list of seven reasons why journalists, and not just "cubs reporters," should be learning to use unmanned aircraft systems -- usually called "drones" in the media. Here's seven more reasons why journalists should consider UAS. 1) They give all news outlets and journalists the freedom to cover important events from the sky. Traffic snarls? Done. Spot news? Got it. Weather reports? Sure thing. 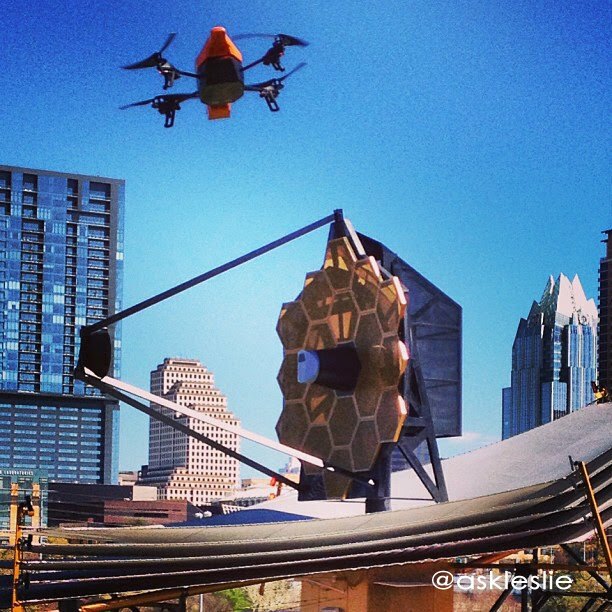 Aerial view of Nasa’s latest space telescope at South By Southwest? Absolutely. These are all events that could be covered before by large, expensive news helicopters. Of course, only stations in the largest of markets could afford such a luxury. But thanks to inexpensive, small unmanned aircraft, that is no longer the case. Ted Pretty, a meteorologist for a Fox station in Las Vegas, was one of our first members at DroneJournalism.org. While his station couldn't buy a helicopter, it did have the wherewithal and foresight to send him to an online UAV school. He's now experimenting with a multirotor system, and uploaded some of the results on YouTube. 2) They collect geospatial data to monitor the impact of natural and man-made disasters. Unmanned aircraft aren't just about getting pretty pictures, although you can get some very pretty footage with a "drone." These aircraft are essentially flying boxes, into which you can cram any number of sensors. High definition video cameras are just one type of sensor. Light detection and ranging (LIDAR), infrared sensors, and Geiger counters all provide additional "sight." What can you do with these sensors? You can scan the ground and find the condition of flood zones, chemical spills, hot spots, plants and habitats. They can collect geospatial data, which means journalists can actually measure the impact on the ground. Data collection isn't a natural process for most journalists, but for drones to be used to their fullest, journalists will have to learn how to collect and manage data from this new tool. 3) They make journalists responsible for gathering data instead of sound bites. One of the great feats of data journalism was the Miami Herald's work after Hurricane Andrew, which uncovered that lax building methods and overburdened building inspectors contributed greatly to the devastation. Herald reporter Steve Doig felt it in his gut. The roof of his house blew off during the storm, after all. But he needed more than a gut feeling to write a story. He needed building records, wind data, and perhaps most importantly -- damage assessments. The damage records were good enough, but they weren't perfect. If Doig were to do it all over again with a "drone," he could obtain better data, and more quickly after the storm. 4) Journalists can be more independent, less reliant on government data. Many news organizations ran great aerial photos picturing the damage before and after tropical storm Sandy. The problem? All those pictures came from the government. What if the government is untrustworthy? What if the government doesn't want to provide the data? What if it didn't have the data you were looking for? Unmanned aircraft can put the responsibility of obtaining that data in the hands of journalists. What's more, a journalist can actually check the validity of government data. 5) They're part of an early warning system. The United States military deployed the long-range Global Hawk UAS to keep tabs on radiation levels during the Fukushima meltdown. There also were at least a couple of Honeywell T-Hawks providing inspections of the crippled nuclear power plant. But the government clamped down on the flow of information, so little, if any, of that data actually made it to the public. What was the public to do? They didn't wait for the data. Hackers began piecing together Arduino microcontrollers with Geiger counters and sharing their data over the internet. They also shared their designs, so others could replicate the nodes and expand the sensor network. Work is already being done to give those sensors "legs," allowing them to penetrate potentially hazardous areas to radio back information. GeigerCopter is one example. One further step would involve deploying "drones" ahead of disasters, or even regularly, to obtain the same information in advance. News organizations could relay data in real time, across and mobile devices, to its audience. 6) They protect reporters from harm. Over the past two decades, more than 2000 journalists have been killed in the line of duty, according to the International Federation of Journalists. In 2009, 139 were lost. ABC foreign correspondent Mark Corcoran has seen some serious things. He’s been to Pakistan, Afghanistan, Iran, Iraq, Yemen, Syria, and Somalia. He’s won awards for his coverage of the Sierra Leone militia and the Afghanistan Taliban. From his experiences, he realized that reporting in dangerous places could be made safer with robotic aircraft. He’s now studying this very idea at the University of Technology in Sydney. An unmanned system won’t mitigate all danger -- we don’t know what would happen to a reporter who is captured with a “drone” in a hostile environment – but it could provide a tool to report on human rights abuses in the world’s hot zones. 7) Journalists should introduce the public to new technology. The media introduced unmanned aircraft to the general public as weapons of war. Because the public gets most of its information about technological advancements from the media, it’s time to give this biased representation some much-needed perspective. Canberra UAV has done a great job with this in Australia. They’ve opened workshops where inquiring minds can come in and build a UAS. Journalists are supposed to inform the public. What better way to inform than to bring “drones” to the public? Let them examine the robots. Let them touch. Let them fly. Most important, show them that this innovation doesn’t have to be a threat. Ultimately it will be the public who decides how we get to use this new tool. We need to show them we’ll use it responsibly.